TEDxSydney 2018 will take place on Friday 15 June at our new home at ICC Sydney, Darling Harbour, allowing us to welcome a record number of attendees into our TEDxSydney community. Our way finding volunteers will be situated at Ground Level in front of ICC Sydney to help guide you to the Event Check-in, located in The Hub on Level 4 Exhibition. 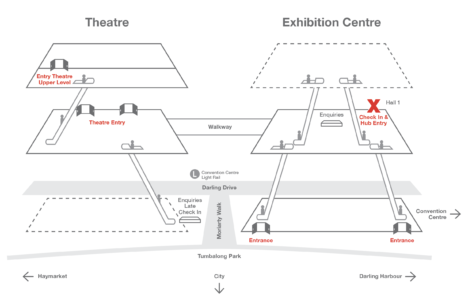 TEDxSydney takes place in the Theatre, entry via walkway on Level 2. The Light Rail travels right through a number of Darling Harbour stations including ICC Sydney’s stops. The best stop for TEDxSydney is Exhibition Centre. Cross the road and head towards Tumbalong Park. For more information, visit the ICC Sydney website. Secure car parking is available and conveniently located within the Darling Harbour precinct. ICC Sydney operates two 24 hour car parking stations with a total of 826 parking spaces including 11 disabled parking bays, 25 motorcycle parking spaces, 50 bicycle racks and 20 electric car charge spaces.